Best Neckband Headphones (2019): Buyer’s Guide & Our Top Picks - Headphones Geek in-ear headphones. Here are some of the best neckband headphones you can get today. The Sony Premium Noise Cancelling neckband Headphones are optimized for travel, but honestly, they have all the features anyone would want in neckband headphones. They have active digital noise cancellation to remove background noise, and are optimized for changes in atmospheric pressure to make flying easier. They have exceptional audio quality, for clarity and depth throughout the frequency range. They are compatible with Google Voice, and are also with the Sony Connect app that lets you customize your audio settings to your preferences. They work in wired or wireless mode, so you don't have to worry about running out of battery life, and are an exceptional pair of headphones overall. If the price tag on the Sony Premiums is a drawback, consider the Mpow Jaws Gen-5. They are the only neckband headphones on our list with Bluetooth 5.0 technology, which gives faster, more stable pairing, longer range, and lower power consumption. Every manufacturer is innovating different styles and approaches to neckband headphones, and they don't all get it right. For the best experience, think about when and how you will be using your neckband headphones, to help you make the right choice. Here are a couple things to keep in mind. 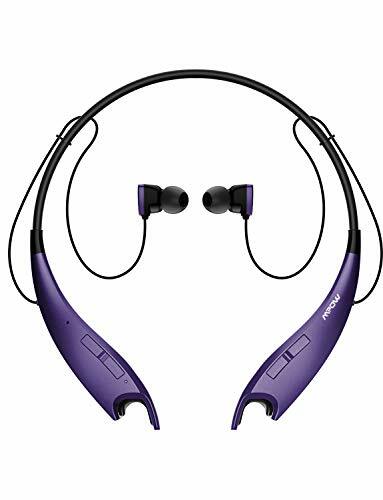 Many people want neckband headphones for working out. However, if your routine involves running, jogging, or other bouncing activities, neckband headphones may end up bouncing on your collarbones, which can be irritating and uncomfortable. Likewise, if your workout involves bending over or inclining backward, they may slip off your neck and fall out. Consider your full range of motion when choosing neckband headphones. Neckband headphones have control buttons on the collar. Sometimes these buttons can be tiny and hard to manipulate, particularly if they are on the inside, near your neck. If the buttons are sensitive, and you shift or move (or fall asleep on an airplane, for example), you may unintentionally nudge these buttons. Particularly with retracting headphones, an unexpected retraction can be an unpleasant surprise. 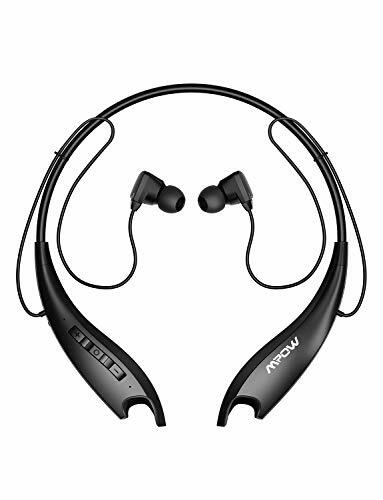 The Mpow Jaws Gen-5 Bluetooth headphones are truly a bargain, loaded with features everyone wants in neckband headphones. They have rich sound and deep bass, and Bluetooth 5.0 technology for faster pairing, more stable connections, and a longer battery life. On a 3-hour charge, they can last for 18 hours of active use, or up to 450 hours of standby time. The built-in microphone has CVC 6.0 noise reduction, to filter out background noise and make your calls as clear as possible. The neckband has a convenient magnet attachment, so your earplugs rest securely in place when they aren't needed. The flexible, lightweight silicone neckband is comfortable to wear, and can vibrate to alert you to incoming calls. It comes with 4 sizes of soft, silicone ear tips so you can find the perfect fit, and has a 45 day guarantee and 18 month warranty. The Mpow Jaws Gen-5 Bluetooth headphones have an incredible range of features and capabilities. The lightweight neckband is comfortable, and will vibrate to alert you to an incoming call if you have stepped away from your phone, and onboard controls make it fast and easy to take calls and make adjustments. Bluetooth 5.0 gives a more stable connection for freedom of movement, and they have a long battery life as well. The TaoTronics Neckband Bluetooth headphones have active noise-cancelling technologies to reduce background noise and let you enjoy your audio with fewer distractions. They have CVC 6.0 to improve voice quality and clarity on your calls, even in noisy environments. They have a waterproof rating of IPX5, protecting them from sweat, light rain, and occasional splashes of water. The integrated magnet attaches your earbuds for secure, stable carrying when they aren't in use. They have an 8-hour battery life with noise cancelling active, or 16 hours without noise cancellation, and charge in 2 hours. They come with a total of 6 sizes of ear tips, and 6 sizes of ear hooks, so you can find your perfect fit. 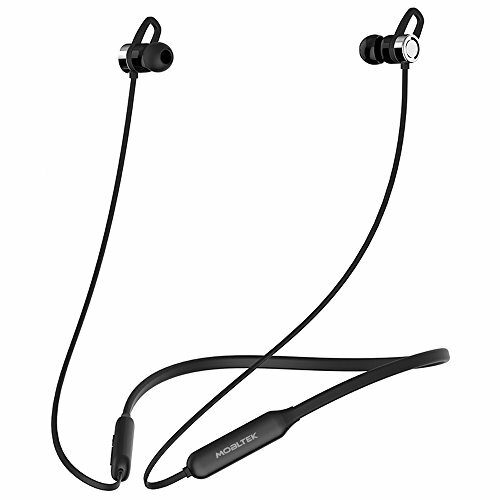 With an IPX5 waterproof rating, you can take the TaoTronics Neckband Bluetooth headphones out in the rain or to a tough workout at the gym without worrying about water damage. The earbuds snap together when not in use, for extra hands-free security. They have active noise cancellation to reduce background noise and distractions, and noise cancellation in the microphone to improve call clarity. These tiny headphones are portable, versatile, and wireless to fit into any situation. The Sennheiser HD1 In-Ear Wireless headphones won the Best Product EISA award for 2017-2018. They deliver exceptional audio quality in a neckband headphone. They have high-quality transducers mounted in precision milled stainless steel sound tunnels for resonant bass, detailed vocals, and a big sound stage. They have up to 10 hours of battery life, and a charging time of 1.5 hours. You can use Bluetooth 4.1 to pair them with 2 devices at once and manage 3-way calls. The neckband is made of soft nappa leather for all-day comfort. They come with a stylish carrying case, and they also come with 4 sizes of soft ear tips for the perfect fit. They have a 2-year warranty. The award-winning Sennheiser HD1 In-Ear Wireless headphones are comfortable and luxurious, with high-quality materials and design throughout. They have exceptional sound quality in a neckband headphone, with big, clear sound throughout the spectrum. They can be paired with 2 devices at once, and easily manage 3-way calls. The Bose Hearphones are designed with directional microphones in each ear that allow you to selectively use active noise reduction to eliminate unwanted sounds, or selectively augment desired external sounds and help you focus on the conversation right in front of you. The lightweight neckband is comfortable for all-day wear, and a 10-hour battery life will last as long as you need it; they charge in 3 hours. The inline remote controls volume, skips tracks, and expedites phone calls. But you can also fine tune and customize your listening experience with the Bose Hear app. With the app, you can emphasize the frequencies you prefer to hear music and calls exactly the way you want. They come with three sizes of soft, silicone ear tips for a comfortable fit all day. The Bose Hearphones are optimized for clarity when speaking, either in person or on the phone. However, their active noise cancellation and companion app can also make your music, movies, and media sound fantastic and reduce distractions. Planar magnets are known for their incredible accuracy, audio response, and control. The RHA CL2 Planar in-Ear headphones are an incredible luxury in neckband headphones. They have the world’s smallest planar magnetic drivers in injection molded zirconium housings for exceptional sound clarity and quality. It also has noise-isolating functionality. With detachable housings, these headphones can be used wired or wirelessly, either by plugging directly into your phone or audio output, or into the flexible neckband and using Bluetooth connectivity. They come with a choice of high-quality, oxygen-free cables that are braided for signal strength and durability. 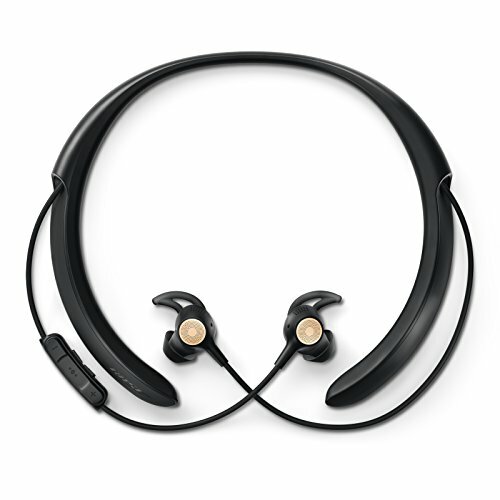 The flexible neckband has a 12-hour battery life, and moldable ear hooks for comfort. It comes with a folding flight case, carry pouch, airplane adapter, sport clip, and multiple ear tips and hooks for customized fit. Use the folding case for traveling with all your cables and components, or tuck them into the pouch for day-to-day use. These headphones were designed in Scotland and come with a 3-year warranty. These headphones are brand new to market, so we don't have a lot of information about durability. The RHA CL2 Planar in-Ear headphones were only released a few months ago, and they are the first in-ear neckband headphones to use the incredible power of planar magnet technology. Audiophiles and experts have given them high praise so far, and they have an incredible range of features. 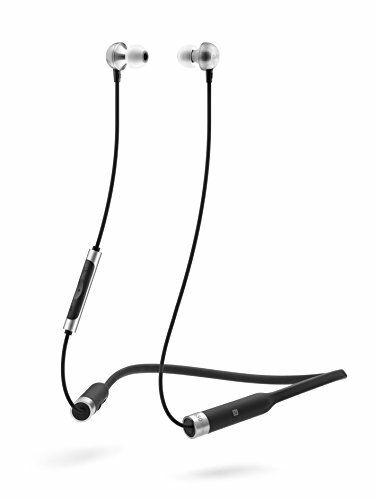 The ability to use them as in-ear or neckband headphones gives them great versatility and prolongs the battery life. The ceramic and zirconium housing is rugged as well as beautiful, and they come with everything you need to enjoy these headphones for years to come. 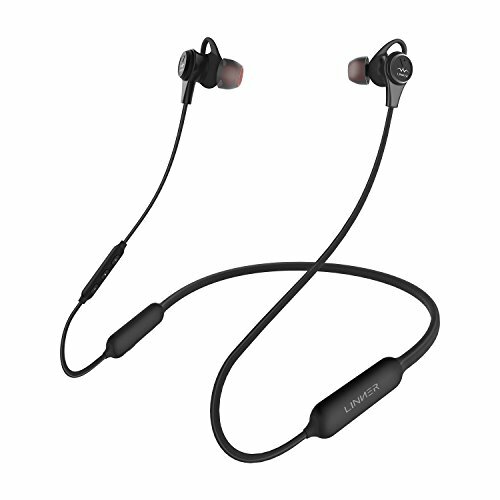 The Sony H700 Hi-Res Wireless In Ear Headphones have DSEE HX digital sound-enhancing technology to extract high-resolution sound quality from compressed audio files, making your music sound fantastic. LDAC automatically adjusts your wireless data transfer rate to ensure the highest quality music in any wireless environment. The specially designed dome drivers have high sensitivity and a wide frequency range. They vibrate to alert you to incoming calls and have a battery life of up to 8 hours. They have inline controls, or you can use the Sony Headphones Connect app to customize your EQ and sound settings just as you like. The on-cable magnets keep your headphones together for security. The Sony H700 Hi-Res Wireless In Ear Headphones have exceptional sound, with dome drivers, LDAC, and DSEE HX all ensuring that your music and audio sound as good as possible. Fast, stable wireless connections make these headphones easy to wear anywhere, and the companion app allows you to personalize and customize your settings. The LG Electronics Tone Pro HBS-750 Bluetooth Wireless Stereo headset has won the Red Dot Design Award, and is designed to be ergonomic and comfortable for all-day wear. Music and phone controls are built into the neckband, for easy access to the features you need fast. It has enhanced audio features like boosted bass for you music, and HD Voice for clear calls. Built-in echo cancellation and noise reduction make audio and calls clear even in noisy environments. You can use Bluetooth 3.0 to connect to two devices at once and has text to speech built-in with Google Voice Actions Integration. You can also choose to have it vibrate to alert you to incoming calls. It has up to 15 hours battery life in use, and up to 21-day battery standby time. It charges in less than 2 hours. It comes with 2 sets of gel ear tips for an adjustable fit. 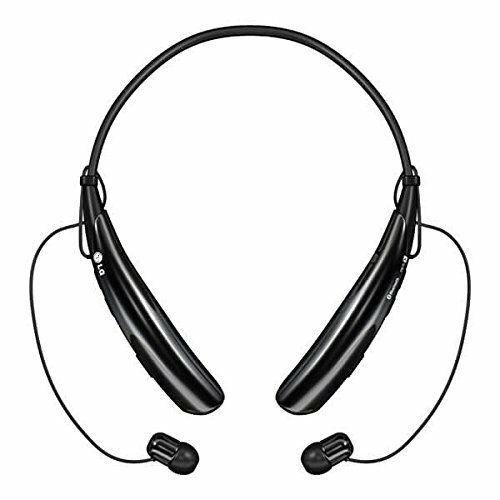 The LG Electronics Tone Pro HBS-750 Bluetooth Wireless Stereo headset is comfortable and lightweight, with an ergonomic design that keeps all your controls intuitive and accessible. The sound is very good, both for media and for calling, and noise reduction improves clarity no matter what you are listening to. Incoming call vibration can be turned on or off, and it can wirelessly connect to two devices at once. With Google Voice Actions, you can control it with your voice, and use text-to-speech for fast communication. The Bluetooth Earbuds Headphones Wireless from Mobltek have high-fidelity, high-definition sound for enjoyment of all your audio. With CVC 6.0 noise reduction technologies, your voice is clearer and call quality is improved. With Bluetooth 4.1, you can wirelessly connect to two different devices at once, and it has a good 33-foot range. The built-in magnets clasp around your neck, for extra security and to prevent tangling. It has an IPX4 waterproof rating, so it’s sweat-proof and splash-proof. It has 10 hours of talking time or 12 hours of music time, and charges in less than 2 hours. The detachable AirWings come in two different sizes, and give the earbuds extra stability to stay put while you are active. It comes with 3 sizes of ear tips, 3 sizes of rubber covers, and has a 45 day money-back guarantee and a 1 year warranty. The Bluetooth Earbuds Headphones Wireless from Mobltek are lightweight, affordable, and have lots of great features. 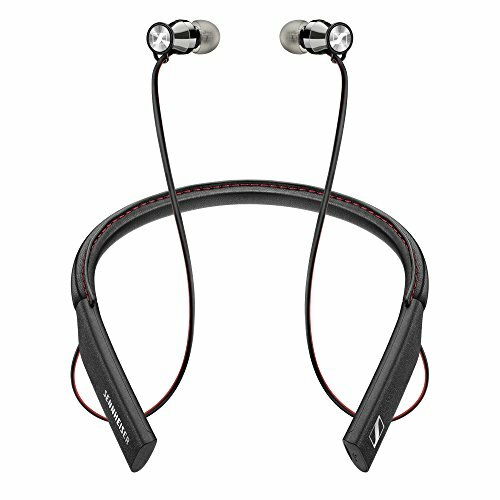 Waterproof neckband headphones give you a lot of options for using them outdoors and during workouts, and a good Bluetooth range, ability to connect to two devices, and intuitive controls make these simple and easy to use in any setting. Voice enhancement and noise cancellation make your calls clear, and the magnet closure and AirWings make them more stable, prevent cord tangling, and improve your experience with these headphones. The Dudios Bluetooth Wireless earbuds have HD sound for good audio quality and enhanced bass. They have a waterproof rating of IPX5, making them sweat-proof, rain-proof, and splash-proof. CVC 6.0 noise cancellation makes your voice clearer and calls easier to hear, even in noisy environments. The magnetic clasp holds them in place when not in use, and prevents cord tangling and wear. The flat cable also prevents wear and tangling. They have up to 8 hours of battery life, and come with 5 pairs of interchangeable ear tips for the perfect fit. They are ergonomic and well-balanced for comfort and stability, and come ready for voice activation with Siri. They also have a 12-month warranty. The Dudios Bluetooth Wireless earbuds are lightweight, flexible, well-balanced, and have a magnetic closure, making them comfortable and easy to use in a lot of settings. They have good audio quality, and the waterproof rating makes them great for most weather conditions. They are Siri-ready, and have noise cancellation that improves the quality of your voice when on calls. 5 pairs of ear tips ensure a good, stable fit for almost anyone. The Sony Premium Noise Cancelling Wireless Behind-Neck headphones have exceptional features for travelers, commuters, and anyone who wants a quiet headphone experience. They have active digital noise cancellation that quiets engine and motor noises, making your audio clearer. They are also optimized for changes in atmospheric pressure, making them perfect for flying. They have excellent audio quality, with DSEE HX, S-master HX, LDAC, and apt HD for great frequency response and clear, detailed audio. They have vibration notification for incoming calls, and a 10-hour battery life. They come optimized for Google Voice, so you can use a digital assistant anywhere. They are also compatible with the Sony Connect app so you can customize your audio settings for the best listening experience anywhere. They come with an adapter for wired as well as wireless audio, an airplane adapter, a carrying case, and three different sizes of ear tips for a custom fit. The ear tips don’t always fit everyone, and insecure fit slips out and doesn’t isolate audio. Some people need to purchase additional/replacement ear tips. The Sony Premium Noise Cancelling Wireless Behind-Neck headphones have fantastic audio quality and noise cancellation, for a great listening experience anywhere. With the companion app, you can customize your audio playback and noise cancellation settings for a personalized audio experience. They are Google Voice ready, for and easy hands-free digital assistant. They are perfect for plane travel, with automatic adjustments for air pressure, and a built-in airplane adapter to switch to wired mode. These headphones are loaded with intelligent, digital features, and are a great option in noise-cancelling headphones. The LINNER NC50 Active Noise Cancelling headphones cancel up to 28dB of unwanted sound, for peace and clarity within your headphones. They have high sensitivity, low impedance, and a titanium diaphragm for excellent sound quality. Bluetooth 4.1 creates a stable, long-range signal, and can connect to two devices at once. They are waterproof rated IPX4 for light sweat, rain, and mild splashing, so there’s no concern about wearing these for workouts or outdoors. They are Siri-ready for hands-free communication. They have comfortable silicone ear tips, and come with 3 sizes of ear tips for the right fit for you, and have ear hooks for stability during wear. Magnetic bonds hold the buds together for stability and to prevent cord tangles when not in use. They have a battery life of up to 13 hours, and charge in 2 hours. They come with a 12-month warranty. The LINNER NC50 Active Noise Cancelling headphones are compact, lightweight, and comfortable. 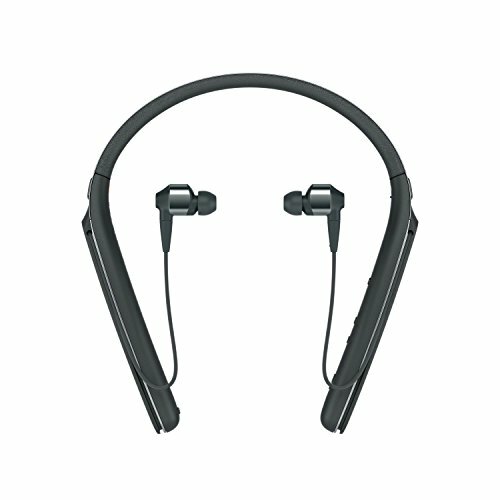 They have very good audio quality for music, and active noise cancellation to remove unwanted background and environment noise. They can be paired to two devices at once and are Siri-compatible for voice control and hands-free calling. Magnetic closure keeps the earbuds together around your neck, preventing accidental loss and cord tangling. An IPX4 waterproof rating means they can be used in moist and damp environments without concern. 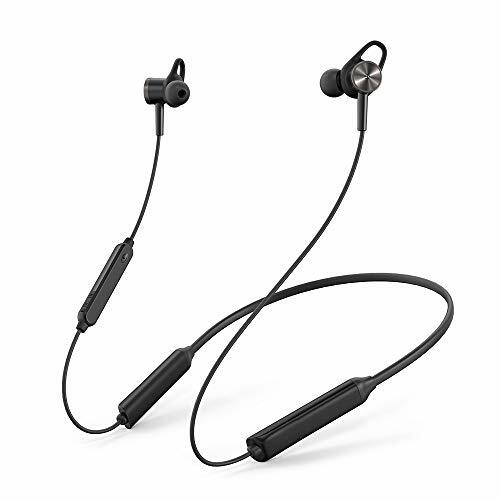 The Bluenin BBH-919S Bluetooth headphones use Bluetooth 4.1 wireless technology and CSR8645 chips for fast, stable wireless connections. AptX stereo sound creates good audio for music and entertainment. 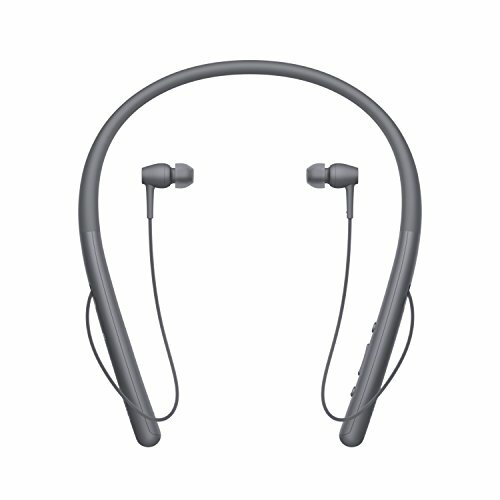 They have CVC 6.0 noise cancellation that makes your voice clearer on calls and reduces background noise. They have a waterproof rating of IPX4, to resist sweat and rain. The retractable ear buds prevent cord tangling, and let you use just as much cable as you need, to keep them out of the way. They weigh just 1.4 ounces, have 14 hours of use time, with 180 hours of standby time, and charge in less than 2 hours. You can connect two devices at once, and use onboard AI voice commands to connect to Siri, Bixby, and Android devices so you can use these headphones hands-free. The neckband vibrates when you have an incoming call. The Bluenin BBH-919S Bluetooth headphones are lightweight, stylish, and have retractable cables that make cable management easy and prevent losing earbuds. They have good sound quality, both for your music and for your calls. A waterproof rating of IPX4 is convenient for workouts and bad weather, and they have a good battery life. Built-in voice controls make it easy to use these headphones hands-free, making them great for workouts. The HX831 Wireless Headphones Retractable earbuds have a distinctive style and a sleek look. The matte surface resists fingerprints and sweat stains for lasting good looks. They have Apt-X audio technology and high output speaker drivers to improve your sound quality, and CVC 6.0 noise cancellation for clear calling even in loud environments. They vibrate to alert you to incoming calls. The wire length can be adjusted and retracted to reduce tangles and wear on audio cables. Bluetooth 4.1 gives fast, stable pairing for up to two devices at once, and has a 32 foot range. They have a waterproof rating of IPX5. They have up to 15 hours battery life, and 350 hours of standby time, and charge in 2 hours. They weigh just 1.2 ounces and are made of comfortable, durable silicone. They come with 3 sizes of ear tips, and come with a charging cable. The HX831 Wireless Headphones Retractable earbuds are stylish looking, and have a comfortable silicone band that resists sweat and fingerprints. The IPX5 waterproof rating makes them great for workouts, and a noise cancelling microphone makes it easy to take clear calls. The cords retract with the push of a button, making them more streamlined to use, and reducing tangles and wear on the cables. They have a good battery life, and good sound quality. The RHA MA650 Wireless Earbuds: Sweat-Proof Bluetooth in-Ear headphones have AptX and AAC playback technologies, along with high-grade aluminum housings and a custom dynamic driver, so your music is CD quality. They have powerful bass and clear trebles. 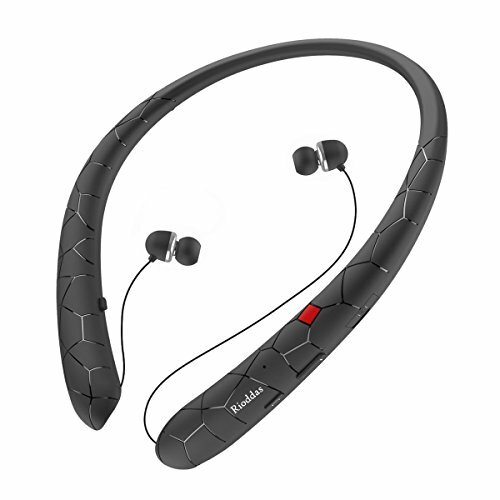 The flexible neckband is IPX4 waterproof rated, and resists sweat and water. They have a 12-hour battery life and up to 30-days standby power. They are compatible with Siri, Cortana, and Google Assistant. The universal 3-button remote offers fast and easy control of mobile devices. Magnetic closure keeps them around the neck when they are not in use. They come with noise-isolating foam ear tips to reduce unwanted background noise. Altogether, they come with 6 pairs of silicone dual density ear tips, 2 pairs of silicone double flange ear tips, a pair of memory foam ear tips, a cable clip, and a carrying case. They have a 3-year warranty. The RHA MA650 Wireless Earbuds: Sweat-Proof Bluetooth in-Ear headphones have great sound quality and a waterproof rating of IPX4 to keep you motivated at the gym, even during tough workouts. The wide range of ear tip styles and materials helps you find the right fit for you, and easy integration with voice control and digital assistants keeps you hands-free and functional. They have a good battery life, and memory foam ear tips help to improve sound isolation. The AMORNO Foldable Wireless Neckband headset is foldable and retractable, and ultra-compact in size for travel or storage. They weigh less than 2 ounces, for easy wearing anywhere. They have Bluetooth 4.1 and CSR8635 chips for fast and stable wireless connections, and can connect to two devices at once. The range is about 32 feet. They have CVC 6.0 noise-cancellation technology to make your calls clearer even when there is background noise. The earbuds are retractable, so you can manage your cables with minimum wear and tangling. They have up to 12 hours of battery life, 180 hours of standby time, and charge in 3.5 hours. They vibrate to alert you to an incoming call. The AMORNO Foldable Wireless Neckband headset is lightweight and comfortable, with easy onboard hands-free controls that make workouts easy. The retracting cable and foldable design makes them easy to take anywhere. 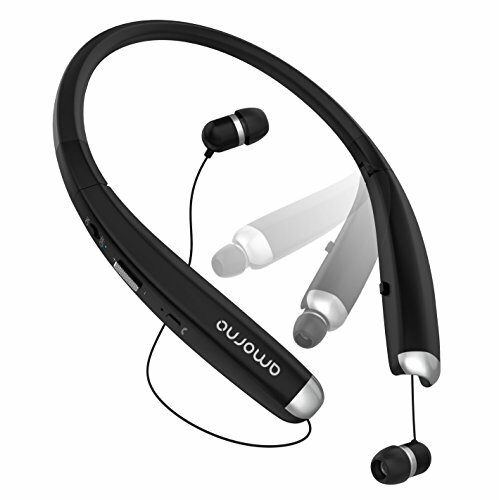 CVC 6.0 noise cancellation makes your calls more clear, and they have a good Bluetooth range and battery life. 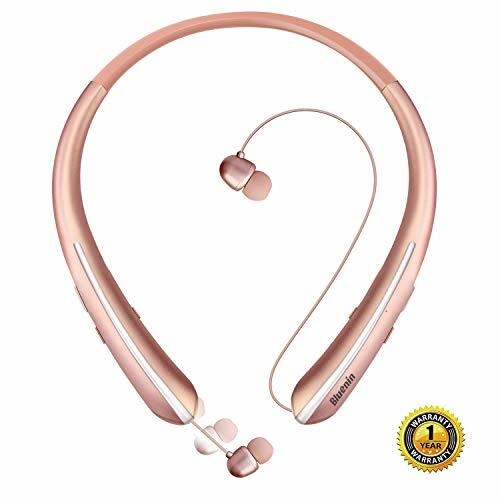 The Philips Rich Bass Neckband Headphones SHS5200/28 are all about music. They have a 24k gold-plated plug for a stable, reliable connection with no audio quality degradation. Bass beat air vents allow air movement for better, richer sound. The ear cushions are comfortable for long-term wear, and designed to improve bass response, making these a good choice for people who find earbuds uncomfortable. They have an ergonomic shape and design to improve comfort. The pull relief system improves the life and reliability of your cables, while the single-sided textile-covered oxygen-free cable resists tangling. The neckband is reflective for visibility in the dark. They have a 1-year limited warranty. 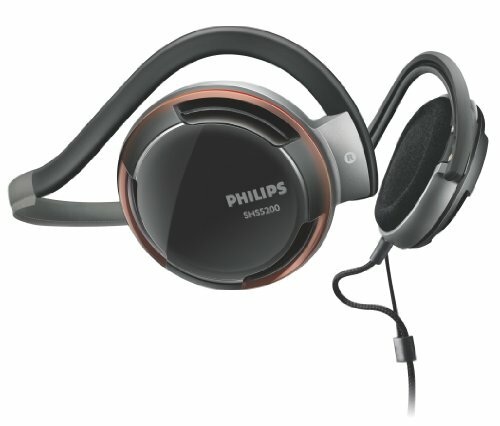 The Philips Rich Bass Neckband Headphones SHS5200/28 are fantastic for music, with a rich bass and clear sound augmented by high quality cables and materials. 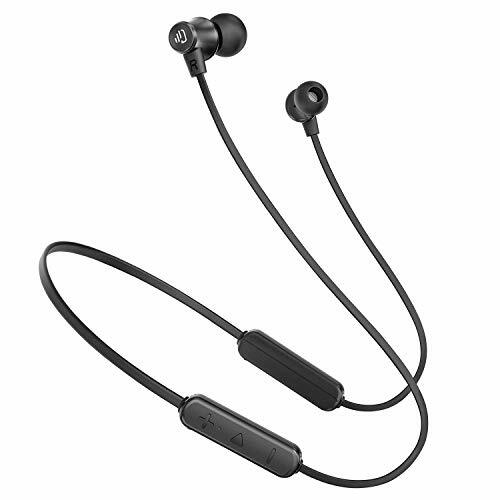 They also have an ergonomic, behind-the-ear neckband design that is comfortable and stable, and the over-ear cushions are a great option for people who find in-ear headphones to be awkward or uncomfortable. The neckband has a reflective surface to improve your visibility and safety at night. 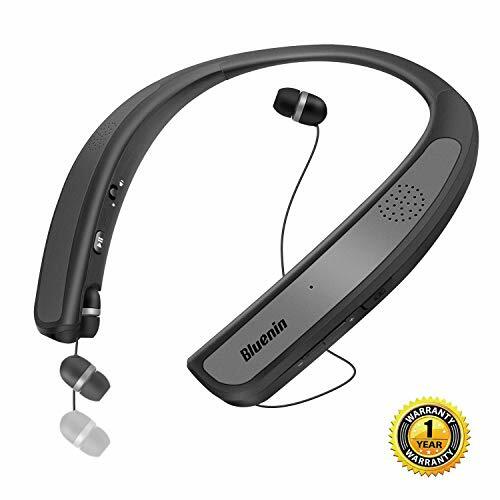 The Bluetooth Headphones Speaker 2 in 1, Bluenin Neckband Wireless headset has two modes; you can use the earbuds to privately hear your music or calls, or use the built-in, directed speakers in the neckband itself to share your music or enjoy your audio without removing you from the surrounding environment. It has true 3D surround sound with 4 speakers for dimensional sound. It has a flexible, lightweight silicone neckband for all-day comfort, and an IPX4 waterproof rating to resist sweat and rain. The retractable wires stay compact and prevent tangles. You can make hands-free calls for yourself or on speaker. It has a 10-hour battery life. It uses Bluetooth 4.1 for fast pairing with up to two devices at once, and has a range of about 33 feet. It comes with a 12-month warranty, 3 pairs of ear tips, and is available in black, grey, or rose gold colors. The innovative, 2-in-1 feature of the Bluetooth Headphones Speaker 2 in 1, Bluenin Neckband Wireless headset means that you can not only listen to your music and take calls hands-free, but you can also share your music, calls, and audio with others. It is comfortable and waterproof for worry-free use during workouts or in a light rain. The retractable cables resist tangling and make wearing easy, and it can be paired with two different devices at once. Neckband headphones are a great way to keep your audio with you without managing fussy earbud cables or putting pressure on your head and ears. They are stylish and comfortable, and today's models deliver the audio quality and advanced technologies that you would expect. Whether you are working out, commuting, or studying, neckband headphones are a fantastic option for cutting the cord and simplifying your life.